Buy 8 Value 30"x25' Wrapping Paper get 1 free! 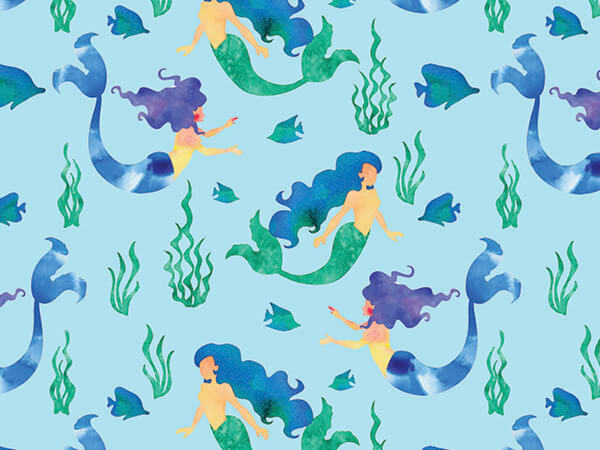 Magical mermaids swim under the sea with the fish on this 30" x 25' gift wrapping paper. Value 30" x 25' gift wraps are buy 7 rolls and get the 8th roll of your choice FREE! Mix and match these designs to create your own perfect assortment! We have designs for any occasion including fun donuts, mermaids, balloons and unicorns for birthdays; floral designs; trendy designs like pineapples, cactus and bicycles; and pet designs for your best furry friends! Pre-packed assortments are a great option for resale! Each assortment contains 4 rolls of 6 different designs. Each roll is poly wrapped and labeled for easy resale. All gift wrap is printed on heavy weight paper which offers great coverage for your packages! Made in the USA!